Imanshahidi, M. (2006). Effect of Extracellular Calcium Depletion on Atrial Natriuretic Factor Secretion and Gene Expression. 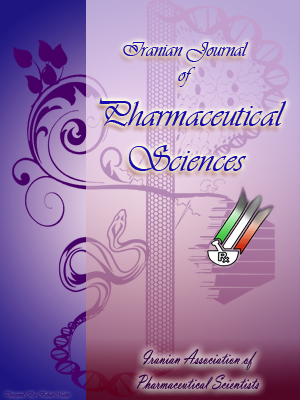 Iranian Journal of Pharmaceutical Sciences, 2(1), 23-30. Mohsen Imanshahidi. "Effect of Extracellular Calcium Depletion on Atrial Natriuretic Factor Secretion and Gene Expression". Iranian Journal of Pharmaceutical Sciences, 2, 1, 2006, 23-30. Imanshahidi, M. (2006). 'Effect of Extracellular Calcium Depletion on Atrial Natriuretic Factor Secretion and Gene Expression', Iranian Journal of Pharmaceutical Sciences, 2(1), pp. 23-30. Imanshahidi, M. Effect of Extracellular Calcium Depletion on Atrial Natriuretic Factor Secretion and Gene Expression. Iranian Journal of Pharmaceutical Sciences, 2006; 2(1): 23-30. Extracellular Ca 2+ concentration ([Ca2+]o) may be one of the factors affecting atrial natriuretic factor (ANF) release. In the previous studies, there are opposite reports about the effect of [Ca2+]o on ANF secretion. Therefore, the effect of [Ca2+]o depletion on ANF secretion and gene expression was studied in the present research. Isolated right atria from rats were perfused for 6 and 2 hours in the presence and absence of [Ca2+]o, and ANF secretion were measured using radioimmunoassay method. Cyclohexamide was used in another group as a protein synthesis inhibitor. ANF mRNA level in atria measured by Real time PCR. [Ca 2+]o depletion induced a significant increase in basal ANF release. This stimulatory effect peaked at 2 h, then started to decrease and reached around basal levels by 6 h. Protein synthesis inhibition by cyclohexamide did not abolish or significantly decrease the stimulatory effect of Ca 2+-free media on ANF secretion. The ANF gene expression was not significantly affected by Ca 2+-free media. These results suggest that the contractile and endocrine function of atrial cardiocytes are differently affected by [Ca2+]o and may represent an adaptation to the dual roles of the atrial myocytes contraction and secretion. Atrial natriuretic factor (ANF) is a polypeptide hormone continuously produced and released by contractile atrial myocytes of mammals and participates in regulating body fluid and blood pressure. Thus, atrial cardiomyocytes are involved in both mechanical and endocrine functions of the heart. Appropriate mechanical or neuroendocrine stimuli increase the rate of ANF release with or without a concomitant increase in synthesis [1, 2]. For example, stimulation of ANF release by atrial muscle stretch is well-documented phenomenon demonstrated in vivo and in vitro experiments and is considered as the principal stimulus for ANF release [3-6]. However, exact mechanism(s) mediating ANF synthesis and secretion from atrial cardiocytes are ill-defined . Extracellular Ca2+ concentration ([Ca2+]o) may be one of the factors affecting ANF secretion, as it plays a crucial role in the stimulus-secretion coupling of rennin  and parathormone  and also it has a key role in the process of muscle excitation-contraction coupling. Reports on the regulatory role of [Ca2+]o for ANF secretion have been Controversial. Some studies have reported augmented ANF secretion with increase in extracellular Ca2+ [10-12]; Some others have presented evidence indicating inhibition by [Ca2+]o [13-15] and also it was suggested that [Ca2+]o is not involved in the regulation of ANF secretion [16, 17]. In the present work, the effect of [Ca2+]o depletion on ANF secretion was studied using an isolated perfused right atria model. In addition, the levels of ANF gene expression in the presence and absence of [Ca2+]o were compared. The atria were prepared as described previously . Briefly, the hearts were removed from male Sprague-Dawley rats (300-350 g; Charles River Laboratories, Montreal, PQ, Canada) and placed in a supplemented Krebs-Ringer bicarbonate buffer (KRBB) solution. A PE-160 cannula (1.14 mm ID) was inserted into the inferior vena cava. The cannula had an opening midway facing the atrial chamber. The coronary sinus was ligated, the left auricle was removed, the lower five-sixth of the ventricles was removed, and a PE-10 cannula was inserted into the right atrium via the tricuspid valve. The right atrium dissected in this manner was placed in a heated (30 oC) organ chamber. The organ chamber contained 50 ml of KRBB that was replenished at a rate of 2.5 ml/min. and gassed with 95% O2-5% CO2. The superior vena cava was attached to a cannula from which KRBB (preheated to 30 oC and gassed with 95% O2-5% CO2) was infused at a rate of 3 ml/min. The outflow from the inferior vena cava was connected to a pressure transducer (Narco Bio-System, Houston, TX) that was connected to a physiograph (Narco Bio-System). The intraatrial pressure was adjusted to 0.5 mmHg. The flow of KRBB was from the superior vena cava, into the right atrium, and out the tricuspid valve. The perfusion medium was collected for a 5 min. period in siliconized glass tube by use of a fraction collector (Retriever II, ISCO, Lincoln, NE). After 60 min. of equilibration, in two groups (n=5), perfusion was continued with KRBB containing Ca2+ (2.5 mM) for 2 or 6 h. In another two groups (n=5), perfusion were continued using Ca2+ free KRBB [no CaCl2 + EGTA (2 mM)] for 2 or 6 h. In another group (n=5), after 60 min. equilibration, 2 h. perfusion was continued using KRBB with no Ca2+ added plus 2 mM EGTA and 10 μg/ml cyclohexamide (as a protein synthesis inhibitor). During all experiments, perfusion medium was collected for 5 min. of each 20 min. period. A 50 ìl aliquot was transferred to another tube and kept at -20 oC until for ANF RIA. At the end of the perfusion period, the tissue was rapidly removed and placed in a dissecting dish containing cold buffer. The cannulas were rapidly removed, and the remaining ventricular tissue, blood vessels, and connective tissue were swiftly cut away. The right atrium was flash-frozen in liquid nitrogen and kept at -80 oC for subsequent RNA extraction. Figure1. Basal atrial natriuretic factor (ANF) release from isolated right atria and effect of Ca2+-free media on secretion. Atria were perfused with regular Krebs-Ringer bicarbonate buffer (KRBB) ( ) or Ca2+ omitted and EGTA (2 mM) added KRBB (+ ) for 360 min. irANF immunoreactive ANF. Values are means ± SE; n=5, **p< 0.01; ***p< 0.001 (by unpaired test). Figure 2. ANF release from isolated right atria and effect of Ca2+-free media on secretion. Atria were perfused with regular( ) or Ca2+ omitted and EGTA (2 mM) added KRBB ( ) for 120 min. irANF immunoreactive ANF. Values are means ± SE; n=5. ***p< 0.001 (by unpaired t test). RIA was performed using the doubleantibody technique as previously described . A1:2 dilution of perfusate was used for the ANF RIA. Antisera raised against rat ANF99-126 was obtained from Peninsula Labs. (Belmont, CA). 125I-labeled ANF99-126 was made by ANF iodination in our lab. Cross-reactivity of ANF antisera with BNP peptide was less than 0.01%. Figure 3. Effect of cyclohexamide on Ca2+-free media stimulated ANF release. Atria were perfused Ca2+ omitted and EGTA (2 mM) added KRBB (+ ) or Ca2+ omitted and EGTA (2 mM) added KRBB in the presence of cyclohexamide (10 μ/ml)( )for 120 min. irANF immunoreactive ANF. Values are means ± SE (n=5). There is not significant difference between two groups (p> 0.05) (by unpaired t test). Tissue samples were extracted using trizol (GBCO BRL; Burlington, ON, Canada) and RNA was quantified by spectrophotometry. Total RNA samples (1 ìg of each sample) were reverse-transcribed using Super Script II RNase H-Reverse Transcriptase and oligo(dt)12-18 primer of a reverse transcription kit (GIBCO BRL) for 50 min. at 42 oC. Then the reverse transcriptase was inactivated by heating for 15 min. at 70 oC. The polymerase chain reaction (PCR) were conducted using primers specific to ANF (Sense: 5’-GCCGGTAGAAGATGAGGTCA- 3’ & Antisense: 5’-GGGCTCCAATCC TGTCAATC-3’) that were designed from published sequences , and were made by Qiagen. The expected lengths of PCR products for ANF was 269 bp. PCR carried out using fast start taq DNA polymerase, reaction buffer, dNTP, SYBR Green I, MgCl2 from a real Time PCR kit (Roche) and light cycler instrument (Roche). The thermal cycle program was 30 cycles that each cycle was set as denaturation at 95 oC for 15 s, annealing at 60 oC for 15 s, and elongation at 72 oC for 25 s. As a house keeping gene, â-actin mRNA was simultaneously amplified at 30 cycles under same profile as used for ANF. The specificity of the amplified PCR products were approved using the melting curve analysis by increasing temperature from 68 to 95 and also using gel electrophoresis. All data are reported as mean ± SE. Unpaired student’s t-test was used to significance of the difference between means Significance was accepted at p< 0.05. Figure 4. Relative abundance of ANF transcripts in rat’s right atria after 2 hours perfusion with regular or Ca2+ omitted and EGTA (2 mM) added KRBB. Relative expression levels of ANF mRNA are normalized against β-actin. Values are means ± SE (n=5). There is not significant difference between two groups (p>0.05) (by unpaired t-test). The beating rate in atriums perfused with regular KRBB averaged 165±15 Beats/min. But in Ca2+-free KRBB groups, few minutes after perfusion with Ca2+-free media, the atrial beating were abolished. Immunoreactive (ir) ANF secretion rates significantly increased by Ca2+-free KRBB in comparison with regular KRBB (Figure 1). This stimulatory effect peaked at 2 h, then started to decrease and reached around basal levels by 6 h. Regarding morphologic study, light and electron microscopy showed cell death and necrosis in atriums perfused by Ca2+-free KRBB for 6 h; it seemed that 6 h is too long for perfusion and so in other set of experiments, 2 h perfusion with Ca2+-free KRBB was performed. As expected, ir-ANF secretion rates during 2 h perfusion with regular and Ca2+-free KRBB were similar to first 2 h in 6 h perfusion experiments (Figure 2). Two hours perfusion with Ca2+-free KRBB didn’t cause tissue death, because at the end of 2 h perfusion, switching to regular KRBB restarted atrial beating. To determine the effect of protein synthesis inhibition on Ca2+-free media stimulated release of ANF, perfusion was performed in the presence of cyclohexamide as a protein synthesis inhibitor. As showed in Figure 3, cyclohexamide couldn’t abolish or significantly decrease the stimulatory effect of Ca2+-free media on ANF secretion. Figure 4 shows atrial ANF mRNA levels in regulated and Ca2+-free KRBB groups after 2 h of perfusion. The ANF gene expression was not significantly affected by Ca2+-free media (p>0.05). Also in the 6 h perfusion groups, the amount of ANF mRNA in regular and Ca2+-free KRBB were not significantly different (data not shown). But the data wasn’t considered because too long perfusion that causes cell death may affect the amount of ANF mRNA. I examined the effect of [Ca2+]o depletion on perfused right atria and showed that Ca2+- free medium stimulates ANF secretion without significant effect on ANF gene expression. I also showed that protein synthesis inhibition cannot prevent this stimulatory effect of [Ca2+]o depletion on ANF secretion. These results are in agreement with some studies [13-15, 21] and in disagreement with some other [10, 12, 22]. The discrepancy between these two lines of evidence cannot be easily reconciled. But, most plausible reason may reside in the differences in atrial preparations. The cellular mechanism involved in releasing ANF in response to [Ca2+]o depletion has not so far been explored. The secretory mechanisms of parathormone and rennin which have also been shown to be negatively regulated by [Ca2+]o may have common features with the ANF mechanism. Although Ca2+-free medium abolished beating of atria because of cellular depolarization, but this stimulatory effect on ANF secretion cannot refer to atrium depolarization caused by [Ca2+]o depletion; because perfusion with high-K+ media that causes atrial depolarization and abolishes atrial beating, has not changed ANF release . This dissociation of ANF secretion from depolarization-induced changes in Ca2+ flux is unusual if not unique among cells that secrete peptides or neurotransmitters and probably represent an adaptation to the dual roles of the atrial myocytes, contraction and secretion. The stimulatory effect of [Ca2+]o depletion also is not related to changes in osmolarity, because replacement of Ca2+ with Sr2+ cannot prevent increase in secretion . No significant effect of cyclohexamide asa protein synthesis inhibitor on [Ca2+]o depletion-stimulated ANF secretion is in agreement with the previous studies showed no inhibitory effect of cyclohexamide on stimulated ANF secretion [23, 24]. Therefore, most of response to Ca2+-free stimulated ANF secretion is based on previously synthesized, stored hormone and newly synthesized ANF is the minor component of this response. Decline in Ca2+-free stimulated ANF secretion after two hours of perfusion is probably due to exhaustion of these pools . In a pilot study we fractionated ANF granules using ultracentrifuge and OptiPrepTM (as a density gradient media) and examined the effect of 2 h Ca2+-free medium on the pattern of granule size. The result (not shown) indicated no effect on the size distribution pattern of granules. It suggests that Ca2+-free medium does not deplete a specific type of ANF granules. The gene expression experiment more confirmed that Ca2+-free medium has no effect on ANF synthesis. Most of the previous works that evaluated the effect of [Ca2+]o depletion on ANF secretion, have not determined ANF mRNA level. But in two studies that mRNA has been determined, they have reported opposite results. One study has used an in situ method and showed that continuous perfusion of Ca2+-free solution to rat for 48 h, increases the amount of ANF mRNA in the heart . The cause of this discrepancy between our result and the result of this study can be probably related to duration of experiment (48 h vs. 2 h) and the difference in method (in vivo vs. in vitro). On the other hand, in another study using cardiocytes cell culture, [Ca2+]o depletion for 24 h has caused 3 times decrease in ANF mRNA. But in that study ANF secretion is also decreased . In summary, in this study, it was confirmed that [Ca2+]o depletion increases ANF secretion without significant effect on mRNA expression and ANF synthesis. These results suggest that the contractile and endocrine function of atrial cardiocytes are differently affected by [Ca2+]o atrial beating, a Ca2+ dependent process was abolished after perfusion with Ca2+-free media. In contrast, ANF release was stimulated under the above conditions. Although no physiological condition is expected to entail a very low or none-Ca2+ environment, our finding should only be taken as indicative differences between atrial cardiocytes and most other endocrine cells. I wish to thank the support and advice of Dr. Adolfo J de Bold (University of Ottawa Heart Institute, Canada) through the course of this study. De Bold AJ, Benoit GB, De Bold ML. Mechanical and neuroendocrine regulation of the endocrine heart. Cardiovasc Res 1996; 31: 7-18. De Bold AJ. Atrial natriuretic factor: A hormone produced by the heart. Science 1987; 230: 767-70. Lang RE, Tholken H, Ganten D, Luft FC, Ruskoaho H, Unger T. Atrial natriuretic factor-a circulating hormone stimulated by volume loading. Nature 1985; 314: 264-6.
renal function during head-out water immersion in conscious dogs. Am J Physiol 1986; 251:R1000-4. between atrial natriuretic factor release and mechanical activity. Hypertension 1991; 18: 169-78.
immunoreactive atrial natriuretic peptide secretion in isolated perfused rabbit atria. J Hypertens 1989; 7: 371-5. Bruneau BG, Pizza LA, De Bold AJ. a1-Adrenergic stimulation of isolated rat results in discoordinate increases in natriuretic peptide secretion and gene expression and enhances Egr- 1 and c-Myc expression. Endocrinology 1996; 137: 137-43. Fray JCS, Valentine ND. Calcium and the control of rennin secretion. Endocr Rev 1987; 8: 1-93.
other ions as extracellular (first) messengers. Physiol Rev 1991; 71: 371-411.
release and mRNA synthesis of natriuretic peptides in isolated rat atrium. Pflugers Archiv: Eur J Physiol 1996; 432: 953-60.
hypercalcemia and ouabain on plasma atrial natriuretic polypeptide in anesthetized dogs. Am J Physiol 1988; 255: E437-41. Schiebinger RJ. Calcium, its role in isoproterenol stimulated atrial natriuretic peptide secretion by superfused rat atria. Circ Res 1989; 65: 600-5.
prohormone release and processing in the perfused rat heart. Proc Natl Acad Sci USA 1988; 85: 8365-9.
release. Am J Physiol 1989; 265: H1588-94. the two-step ANP secretion in perfused rabbit atria. Regul Pept 1994; 52: 129-37. Gibbs DM. Noncalcium-dependent modulation of in vitro atrial natriuretic factor release by extracellular osmolarity. Endocrinology 1987;120: 194-7. Ida H, Page E. Determination of atrial natriuretic peptide secretion in cultured atrial myocytes. AmJ Cell Physiol 1989; 256: C608-13. ET-1 in a new model of isolated right atria. Am J Physiol 1997; 273: H2678-86. Sarda IR, de Bold ML, de Bold AJ. Optimization of atrial natriuretic factor radioimmunoassay. Clin Biochem 1989; 22: 11-5.
analysis of mRNA expression of natriuretic peptide family and their receptors in rat inner ear. Mol Brain Res 1998; 55: 165-8.
of arginine vasopressin and extracellular osmolarity on atrial natriuretic peptide release by superfused rat atria. Eur J Pharmacol 1991; 209: 45-55.
the gene for atrial natriuretic factor. Hypertension1990; 15: 20-8.
secretory system for ANP. Am J Physiol 1994; 266: H1854-63. different stages of the secretory process: Ca2+ dependence. Am J Physiol 1991; 261: C1162-72. depleting pool of newly synthesized hormone. Endocrinology 1993; 133: 1398-403.
by extracellular calcium: Parathyroid hormone gene versus atrial natriuretic polypeptide gene. J Clin Invest 1992; 89: 1268-73.